The undo operator can take back your last move(s)/edit(s)/change(s). You can limit or expand how far back in your edits that undo can take you, via Gimp’s preferences (also found in the Edit menu). Due, no doubt, to how often I use it, undo is probably my favorite part of Gimp. Redo can undo the undo operator, and re-apply the last edit(s), but only until another change/edit is made, at which point anything that had been saved in “redo” is lost. The fade command allows you to modify the paint mode and opacity of the last draw-able operation. The undo history command opens up the undo history dialog, where you can scroll through thumbnails of the changes that have been made, and select one to undo the changes made since then, or even to redo (after selecting an undo “level”). I didn’t know about this dialog before, and it’s seriously cool!!! The copy visible command will select all visible content from all layers, rather than just content from the active layer. The paste into command will paste into an existing selection without replacing that selection, so that you can move the newly-pastes selection around within the previous selection. The paste as command allows you to paste as a new image, layer, brush, or pattern. There are 4 commands listed in the buffer sub-menu. The cut named command cuts the active layer’s selection and stores it in a special named buffer rather than in the clipboard. The copy named command copies the active layer’s selection and stores it in a special named buffer rather than in the clipboard. The copy visible named command copies all visible layers’ selections and stores it in a special named buffer rather than in the clipboard. 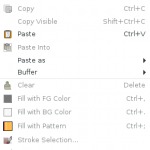 The paste named command brings up the buffer dialog to select a buffer and paste, paste into, or paste as new. The fill with foreground color command fills a selection with the selected foreground color. Keyboard Shortcut: Ctrl + . The fill with background color command fills a selection with the selected background color. The fill with pattern command fills a selection with the selected pattern. The stroke selection command strokes, or fills, the border of a selection with either a solid color, a line, or a paint tool. The stroke path command strokes, or fills, a path with either a solid color, a line, or a paint tool. The preferences command brings up the preferences dialog box, where you can make all sorts of adjustments to Gimp, according to your needs and/or whims. The keyboard shortcuts command brings up a dialog from which you can find, change, and/or create keyboard shortcuts for every tool/command/feature in Gimp. The modules command allows you to browse through and toggle which modules are activated. Changes to modules take place after Gimp is restarted. The units command brings up a dialog showing you the units of measurement available to Gimp, and allows you to create new units. Although most of the edit menu’s commands are widely-known already, there are a few fun surprises among them that should not be overlooked. Join me next week for our next menu exploration.